Live, from Peoria, Illinois it’s a rare Sunday Afternoon edition with your host, Agatucci’s and several special guest stars. 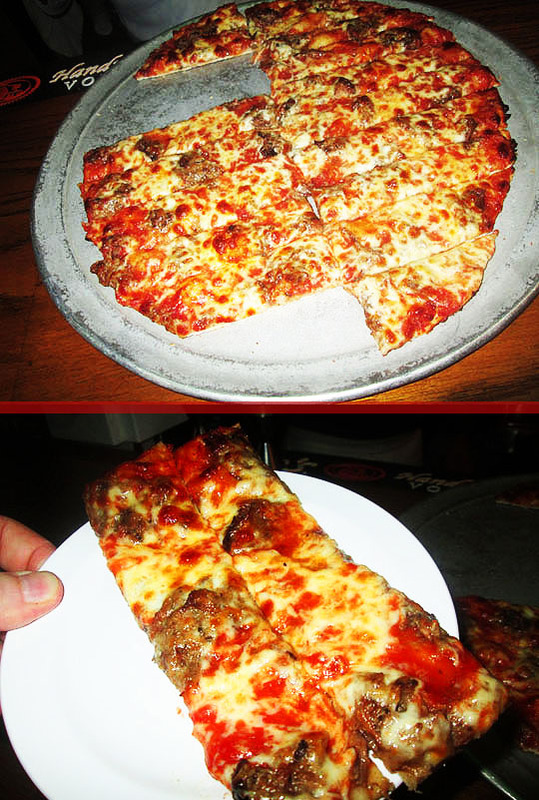 Now please welcome Agatucci’s who are opening on this Superbowl Sunday afternoon for the first time in decades! And get over to Agatucci’s! I had to brave the Sunday afternoon traffic on University Street to get the shot of the outside of Agatucci’s. You’re welcome! Now let’s get inside, it’s too bright out here! It’s nice and dark inside of this rare Sunday afternoon visit to Agatucci’s and there’s the fourth generation owners behind the bar, Tony and Danny! Always great to see those two and Tony borrowed my sunglasses for this shining moment in time! Ryan and Frank were also doing time behind the bar and posed for the MBIP Camera. 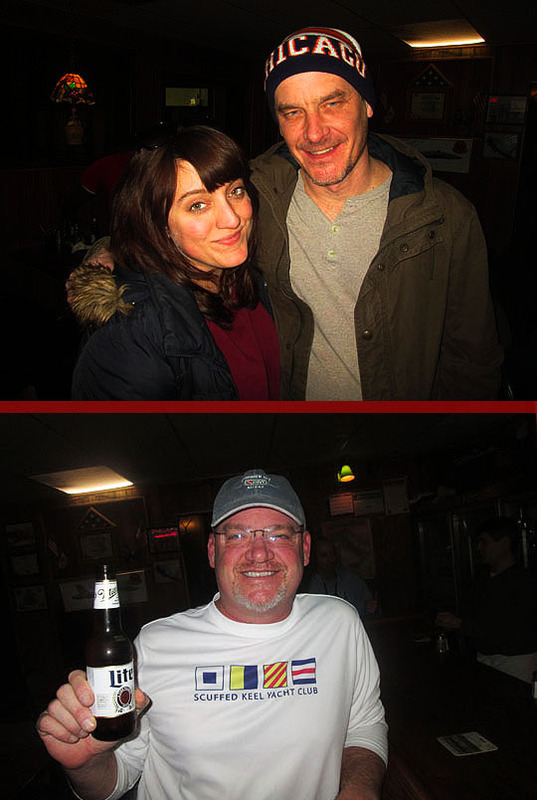 I also ran into Shannon and Mike and Todd up at the bar enjoying the Agatucci afternoon festivities! 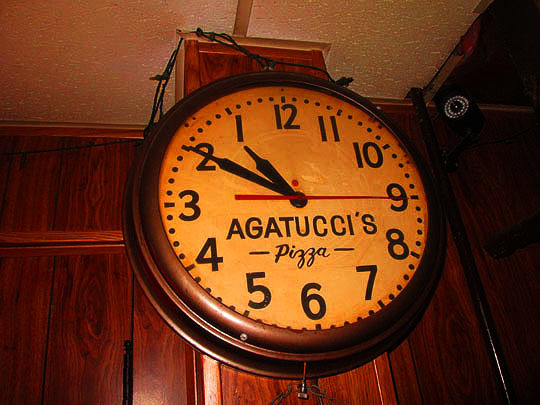 There’s the legendary Agatucci’s backwards clock. This is the first time I’ve ever seen it approaching the 1:00PM hour! As you can see, a good crowd showed up for this rare Agatucci afternoon luncheon party. I took a shot of my favorite booth in the back corner with the decorative wine bottle chandelier hanging overhead. There’s the Agatucci’s Wall of Fame with articles, photos, awards and the bottom photo is Jay Leno with Tony and Danny! Moments later I bumped into Phil who stopped by for the festivities with Allie. Tony was serving up slices of a special pizza he cooked up for this afternoon Agattucci’s party. He made it with Italian Beef and it was delicious! This was a fun afternoon and a nice way to spend a Superbowl Sunday afternoon! 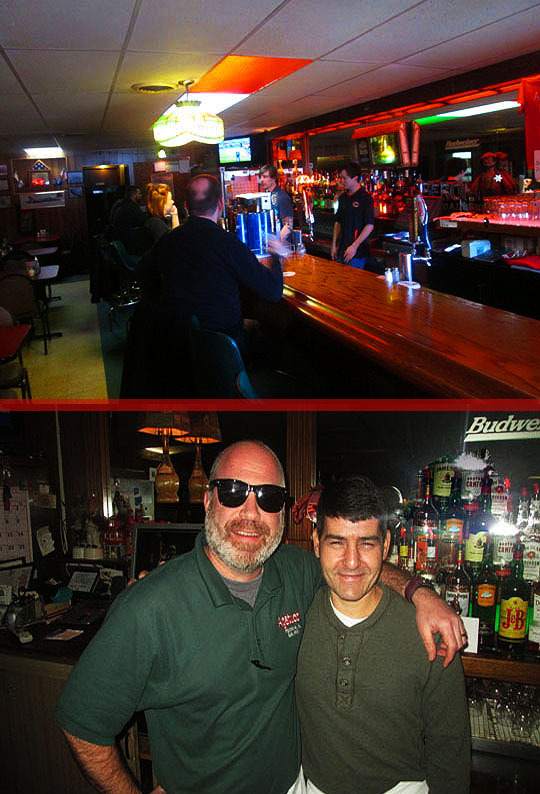 Thanks to Tony and Danny for opening early and for the fun times at Agatucci’s, a Peoria landmark! Related Post: Agatucci’s Induction To The MBIP Twelve-Timers Club!